Moving forward takes guts, y’all. Especially when your time is limited and you need to make every move count. But sometimes progress is slow. Ok, let’s be real. Most of the time progress is slow. Every now and then, I actually accomplish something without a lot of angst. But for the most part, moving the ball forward is with great effort. I think if I started out with the expectation that progress was not going to be easy I would not be so disappointed. But our hopes can tend to be in achieving success, well, easily. That’s laughable, right? The truth is, anyone who wants to make progress in this world has got to be ready to live outside their comfort zone and to set their expectations on contentment with progress, no matter how slow it may seem, rather than achieving the objective at hand. As I have been prayerfully asking God for continued direction in this ministry He has inspired, I have sensed the need to consolidate and codify my message. And so when I finally took the plunge this past week to rename the Hope Reinvented Group to my original name, “Seeing Deep”, it felt like progress. Ahhh. I pushed the letters on my computer and smiled. I changed the settings in the group and was grateful that something was easy. The URL was even available. “Uh, Denise, is that an acronym, or a typo?” (Note to self: always wear reading glasses when changing the name of a group.) Oh. My. Goodness. A typo?!?! Really?!?! Life was over. Well, no, not really. I wrote the book called, “Shame Off You”, remember? Back to reading my book for a dose of medicine . . . Deep breath. Ok, no problem. A typo. Until Facebook’s precious rule pounded me with reality. “You cannot change the name of your group for 28 days if your group size is larger than 5,000”. Uh, my group size is not larger than 5,000. No matter. The. Group. Name. Could. Not. Be Changed. So, instead of writing another blog post, I spent a couple of hours trying to find a way to message Facebook and change my name from “Seeing Deeo” to “Seeing Deep”. At first, I felt a bit of horror. This was not professional. This was going to hinder progress. Then I realized it just did not matter. Laugh it off. Sometimes even in the small errors of life there are beautiful lessons taught to us if we are willing to listen. Maybe mistakes make us pause and check ourselves. What is my ministry name? Yeah . . . see deeper than the problem at hand. Maybe progress is not supposed to look neat. Maybe all the emphasis on being perfect hinders progress. 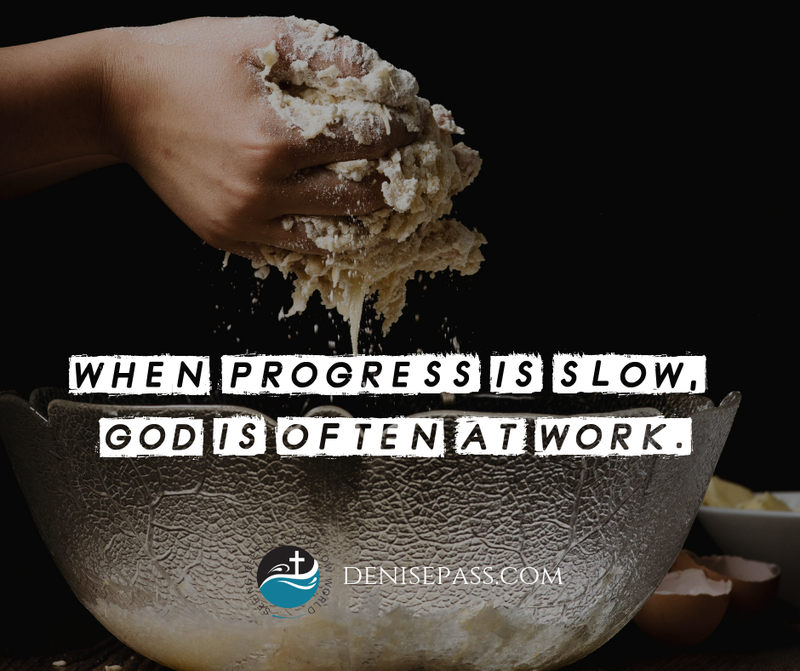 Maybe if progress were not slow, we would not be grateful for finally accomplishing our goals. When progress is slow . . . God is often at work. Like a master potter or a baker, it is the process that makes a work of beauty, not just the ingredients. The end product might receive the praise, but the process itself is the real progress. The work is not just completing a project, but the character formed in the midst. The truth is, I have never been neat when it comes to being creative. I’m a mess, y’all. But my Savior has my back. And oh, how I delight in Him. And His word? It is my refuge when things get a little bit messy in this world. So, don’t be afraid to put yourself out there and try something new. That’s progress, friend. Sometimes the first step is hard and sometimes we will stumble, but there is a larger purpose in all we do. When our efforts are not about us, but about reaching others with His amazing love and grace, it does not matter what it looks like. And when we make mistakes or the progress is slow, an amazing thing happens . . . we are changed in the midst. Our character is fashioned as we work at our calling. And suddenly, it is no longer about making progress, but about being found faithful. Working until He returns. And He weaves all of our efforts into a beautiful piece of art. Join the mailing list and have posts delivered to your inbox! Subscribers are also the first to hear about events, new music, and more! Your contact information is secure and will never be shared with a third party. Denise's posts delivered to your inbox!